JAM! I love it on toast and especially with Peanut Butter. But there is a situation where I am not fond of it and that’s when it applies to my firearms. What is one common reason guns jam often? The answer might surprise you. One of the most common “fixes” people try, to prevent jams, is to soak their guns in oil or lubrication. After all, it is reasonable to think that moving parts should be oiled right? We do it on moving parts all around the house and our car engine loves it too. However, ironically, trying to prevent the gun from jamming by applying a lot lubrication is usually what tends to cause feeding and jamming issues. So where did this idea come from? One popular thought is an old military ideal that still pervades today; the more oil in your AR, especially in the bolt, the better. With older military (and civilian) weapons, tolerances for fitting parts were a lot looser because of manufacturing technology available and to address the concerns of dirt and mud that could get inside. Since it wasn’t always feasible to clean the gun during a battle, soldiers applied a lot of oil to help keep their gun running by pushing mud and gunk out of moving parts. This practice was handed down and with good intentions, people started to oil everything that moved. With current manufacturing technology, guns are designed and built to have very close tolerances for better fit and accuracy. Materials have changed and so the lubricity that is inherent in some materials have gone up too. Basically, the idea that you should bathe your gun in oil is no longer a good idea. We regularly take in guns that have been soaked in oil and we find that it is gummed up pretty bad to the point that the action is no longer smooth and slippery. With hundreds of rounds fired, carbon and copper fouling, gun powder, and all matter of debris have mixed in with the lubrication to create a slurry suitable for constructing a building. (See photo.) Guns like a 1911, which can have a very tight rail to slide fit, will end up slowing down to the point that the gun no longer times right and jams begin to occur. A gun is like a precision watch and it has a timing and rhythm that helps it to function properly. A fraction of a second delay in a single part is all that is needed to cause a misfeed and jam up your gun. If you think your gun needs a good cleaning, bring it by and we’ll let you know if you just need a basic clean or a comprehensive DCOA. (Disassemble, Clean, Oil and Assemble) After a DCOA, we will test fire to check for function and reliability as well. We think you will like it and know your gun will love it! If you have any questions, stop on by and we’ll be happy to answer them. Q. How much lubrication do I really need and where do I put it? A. It all depends on your firearm but the general rule of thumb is, a drop or two is all you need! Consulting your owner’s manual will usually tell you where to apply oil. You will be surprised to find that a lot of moving parts don’t need any oil. Ideally get a needle bottle so that you can get a drop of your favorite oil exactly where you need it. Q. What kind of oil/lubrication should I use? A. 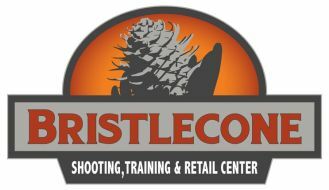 Since there are many excellent options to choose from, Bristlecone has selected a variety of top picks for you to check out. Each one will work great in most situations and firearms. We recommend you try some out and experiment to see which you like the best. 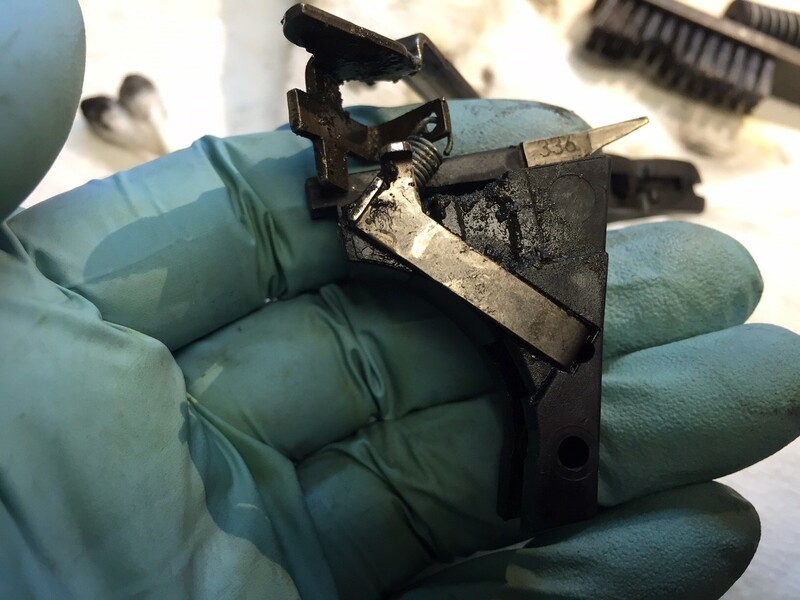 Here is a Glock Trigger Housing that has a sludge and oil mix. The customer complained that the gun was jamming a lot and after we cleaned it up throughly, the gun had no issues.